Just a few photos of my coffee run from today. I was out of grounds, so off to the streetcar. Victory, Colombia El Jordan. Excellent beans! 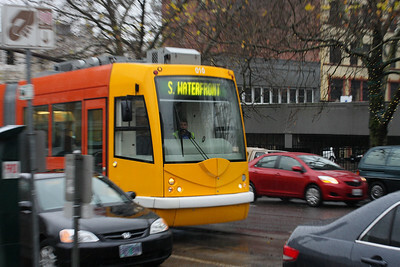 The streetcar zooms into focus, and yes, it was actually zooming up to the stop relative to its normal speed. 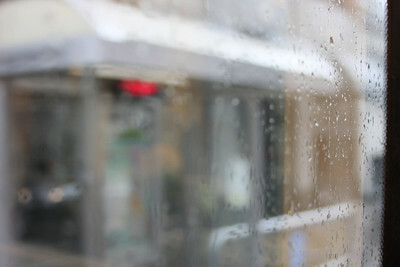 Clarity of the drops on the window with the haze of the world beyond. Twisting around the corner, the front leads the rear of the streetcar. 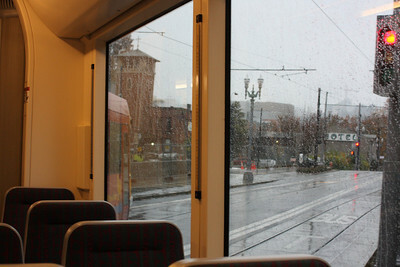 Friday the 20th, 2009, at 4:20pm (yes, 4:20) I boarded the Clackamas bound Green Line at Pioneer Square. I’d knocked out a solid 43+ hour week and stepped out a little early for a ride about. The LRV set was a Type-4 Style, and arrived with about 15% seated occupancy. 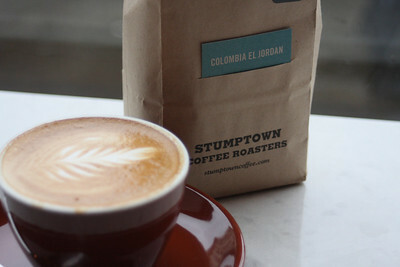 At Pioneer Square that increased to approximately 45% occupancy. The Type-4 set rolled on and by our departure from Lloyd Center had well over 98% seated occupancy and about 8 people standing. This would have made 100% seated if those few would have sat down, but alas, people tend to stand often even when seats are available. At this time of day there is a wide slice of Portland’s population riding the transit. From the American Indian Mother with her two children, behaving exceptionally well I might add, to the Grandmother with her grand daughter going for a ride about also. There where other people in this melting pot of a train, all riding cordially and quietly. The new Type-4 set riding very smooth as expected. With this many people even the door gaps are dampened. By 60th there were a few more people on the light rail, and 100% seated occupancy. The real question is how many will this Green Line Train have once we pass Gateway Transit Center. Being the Banfield Corridor that the Green shares with the Red and Blue Line is easy to fill up with people, it is interesting how many people continue to ride in these shared Interstate Corridors. This brings up the question, has anyone seen legitimate fluctuations in the #72 Route that could honestly be contributed to the opening of the Green Line? So far, everything I had seen points to the Green Line being almost entirely new ridership, taking away only a little from the bus routes (maybe 60% or so new riders, that weren’t previously bus riders). I’d be curious to know if TriMet has any surveys being prepared to determine the makeup of people on the Green Line in this regard, and if they’re doing the same for their most ridden Bus Line the #72. When the Green rolled into Gateway Transit Center, we crossed over the parking lot referred to as I-205. The 3 lanes of Interstate I-205 were jammed pack with cars, moving at maybe 5-15mph. Well below the peak capacity of parking lot 30mph movement. The PSU bound Green Line was just departing as we slid into our platform slot at the transit center. That train was at 95% plus seated capacity with many people standing also. At this point we departed the transit center with my question answered. We had 94% seated occupancy with 7 people standing. Not bad really, being this stands as some pretty serious ridership for the Green Line only portion of the light rail line. Considering the Green Line is handling this capacity, the I-205 is a parking lot moving under capacity, and the Red Line is handling a respective capacity itself, it appears obvious that as a society we have a long ways to go in cleaning up the transport of people at rush hour. There really ought to be a better effort to distribute working hours better, the whole 9-5 concept in modern times is very lacking. These observations leave me with a few key questions still about the Green Line and light rail in the Portland area. 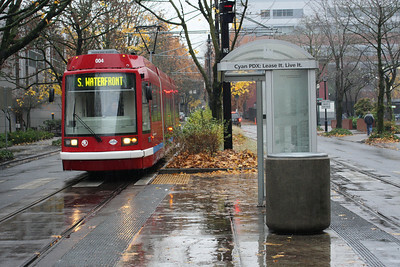 When will light rail ridership exceed bus ridership for the system? My guess is it will possibly exceed bus ridership when employment begins to resume higher numbers and will absolutely exceed bus ridership when the Milwaukee MAX opens. How will the anti-light rail argument change as more of the lines surpass 20+ years and prove themselves cheaper over the long term than BRT or bus lines, thus providing more throughput at lower cost than comparative bus operations? My guess is that the argument will continue unabated, something completely new will alter the argument entirely (like flying cars or something crazy), or the argument will change to be made on a different primary point – ala – a train is stuck on tracks or something. What alterations will take place to the surrounding bus service when the travel patterns are better understood with the addition of the Green Line? My guess is that some of the lines will be altered ever so slightly to meet with the train better. Even though ridership is fairly solid on the Green Line, even surpassing my rather lowball estimates, there are few areas that seem available for real and easily accessible TOD (Transit Oriented Development). The only areas that seem to have feasible land to build TOD on are the Foster, Flavel, and Clackamas Stops. The Flavel and Foster stops have two major issues impeding some development, the fact that the Interstate consumes a vast and large parcel of land. The Clackamas stop simply has the problem of pavement. The entire stop is surrounded by monstrous paved areas; the Interstate to one side, the mall parking lot on the other, and more of the same nonsense to the south of the stop. Making the area a massive, almost un-walkable, mediocre area. Fuller Road seems to have potential, but it also have the pavement problem and has less anchoring it than the Clackamas stop. After making the full route I stayed aboard as other crowded back onto the train for the downtown trip. Again, the train filled up, approximately 75% seated capacity with about a half dozen people standing. It always amazes me that there are always those so hard headed that they’re just going to stand no matter what. As if standing on transit is some type of novel thing to do. Either way, whatever the case, the trip back downtown wasn’t nearly as packed as the outbound trip. Many of the people were teenagers heading downtown to go loiter at Lloyd Center or Pioneer Square Mall. Matter of fact, as I had assumed months back, much of the Green Line passengers are teenagers, probably more so than any of the other MAX Lines. The ride went smoothly, except for a few hiccups in the breaking, which made it seem we had hit someone. Some loud teens got on at Lloyd Center and found the braking hilarious, assuming we’d hit something. I thought it was funny that they fell into a stupor of stupidity and found entertainment in it. They ended up getting off a mere 2 stops later to go smoke some pot. I knew I had picked up some smell of the ganja. I made it back downtown and walked the last 2 blocks home from the last stop. A simple ride about, entertaining, enjoyable, and a nice slice of humanity to observe. It is truly amazing what you can learn from a simple ride around on transit. There is so much going on over at the Bike Portland Blog in regards to this conversation of taxes for roadways, who pays what, and how much, and etc., etc., etc. The conversation is long, often tired, and of course tons of things devolve into ad hominem attacks all over the place. I decided it was time I weighed in, since this is a topic dear to me, as it really makes me rather irate how many people know very little or nothing about how our infrastructure is currently built, maintained (or not), and deemed worthwhile. Fact #1 – The Road System is NOT a product of free-market economics, it is an operationally socialist government mechanism by almost every definition. Just to start off with the first FACT, our road system is NOT a product of free-market economics, open market, fair market, or anything of that nature. By morale compass alone Republicans and Libertarians, if they honestly do support free-markets, should absolutely DESPISE our road system network. Less than 1% is privately owned, maybe 5-10% of it even has a decent return on investment, and about that same 5-10% actually gets appropriately funded and maintained. Our road system in the United States of America is easily a prime example of socialized (socialism/socialist definition available) ownership and operation by the Government of an industry function, or at least something that in the past was largely an industry function in the United States. With that fact, that our road system is a socialized operation, one can see obvious reasons certain things are so convoluted in bureaucracy. The road system is allocated, funded, and maintained as a pull politics bartering tool within the White House and state Governments. The Federal Government has even used the road funding mechanisms to black mail states such as Louisiana to push through economic trade regulations that don’t meet intra-state commerce clauses. A prime example is the Federal Government putting thousands and thousands of bars, restaurants, and other establishments in Louisiana out of business by forcing the state to push their drinking age up to 21 from 18. The point of this being that this encroachment of state rights was done through black mail by our operationally socialist government road system. Fact #2 – The road system is NOT primarily paid for with gas taxes, which fall drastically short of funding our entire road network. Gas taxes make up enough to fund primarily the Interstates, and at that, they don’t complete 100% of the budget and often require additional sources to meet 100% of budget costs. Should all citizens continue to fund the massive subsidies provided to drivers?